Oh, that is so cute! 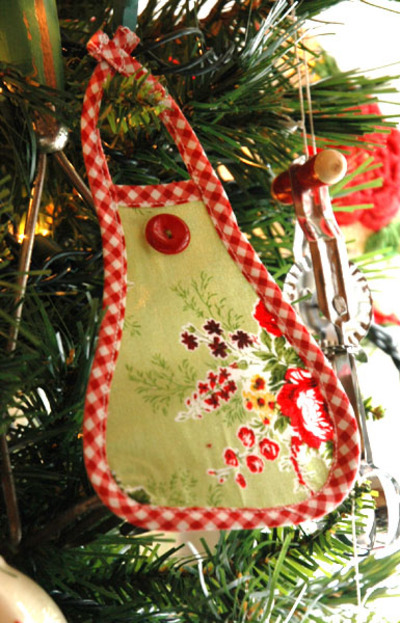 I'm giving some aprons as gifts and may have to whip up a couple of those to use as gift tags/ornaments. This is a sweet idea and I am so smitten with the idea of a kitchen tree... I'm wishin'! Your blog is a happy discovery for me and I look forward to coming around for more posts and inspiration. Thank you, and nice to meet you. She posted it a few years ago now.. I love it. Thanks for the tutorial. I make aprons and this would be such a cute little tag to attach to the gift. My goodness Erica, those are so cute! Ah....that was one of my fav. fabrics ever. I want one!!! Really adorable! I love that apron ornament! I like to collect miniatures and this would look so cute on my tree. Thank you for the tutorial! Darling idea! Thank you for posting the tutorial. How sweet is this! Thanks for the post!